A million years ago, a longtime pattern of alternating glaciations and warm periods dramatically changed, when ice ages suddenly became longer and more intense. Scientists have long suspected that this was connected to the slowdown of a key Atlantic Ocean current system that today once again is slowing. A new study of sediments from the Atlantic bottom directly links this slowdown with a massive buildup of carbon dragged from the air into the abyss. With the system running at full speed, this carbon would have percolated back into the air fairly quickly, but during this period it just stagnated in the depths. This suggests that the carbon drawdown cooled the planet–the opposite of the greenhouse effect we are seeing now, as humans pump carbon into the atmosphere. But if the current keeps slowing now, we should not expect it to help us out by storing our emissions; possibly to the contrary. The study, led by researchers at Columbia University’s Lamont-Doherty Earth Observatory, appears this week in the journal Nature Geoscience. 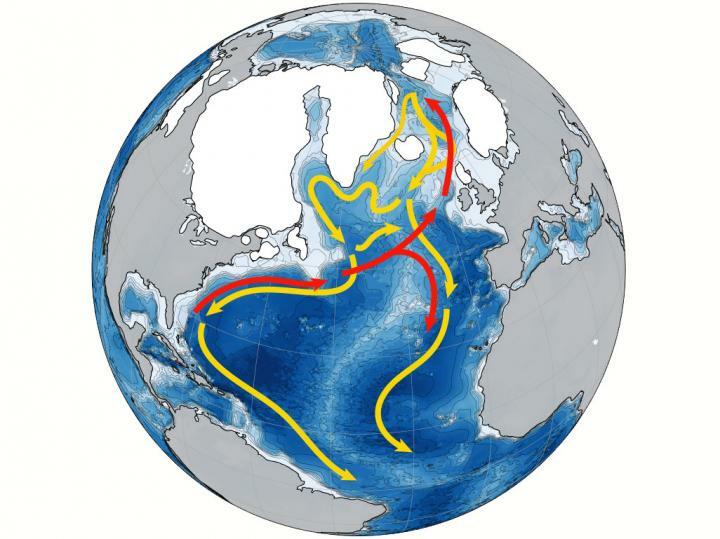 The researchers point out that the AMOC is only part of a much larger system of global circulation that connects all the oceans–the so-called Great Ocean Conveyor, a term coined by the late Lamont-Doherty scientist Wallace Broecker, who laid the groundwork for much of the current research. Much less is known about the carbon dynamics of the Indian and Pacific, which together dwarf the Atlantic, so there are many missing pieces to the puzzle. Ongoing research at Lamont-Doherty is aimed at building carbon chronologies of those other waters in the next few years.